Submitted by Taps Coogan on the 26th of July 2018 to The Sounding Line. 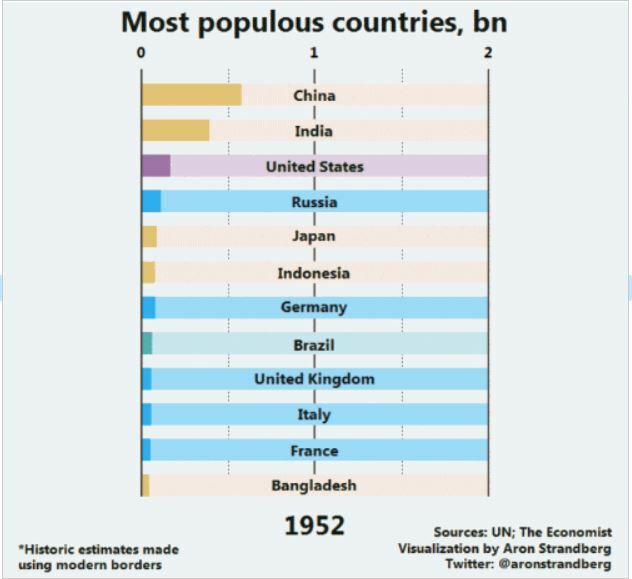 The following visual, from twitter user Aron Strandberg, shows the ranking of the most populous countries, every year since 1950. As we have noted on a number of occasions, the population of Africa, India, and the Middle East is expected to continue to grow dramatically for the rest of the 21st century while the population of the rest of the world is plateauing or declining. 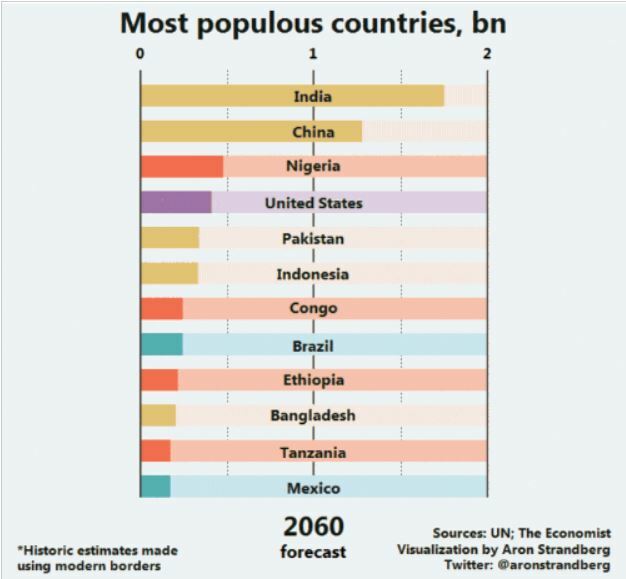 As a result, Russia, Japan, Germany, the UK, Italy, and France are falling off the list of most populous countries and being replaced by Nigeria, Pakistan, Congo, Ethiopia, Tanzania, and Mexico. As the graph below illustrates, Asia has represented roughly 70% or more of the world’s population from 400 BC until 1800 AD with Europe oscillating between roughly 10% and 20% and Africa oscillating between 5% and slightly over 10%. Over the next hundred years Africa’s population is expected to rise to around 35% of the world’s population. Such a shift in population distribution has never been seen in recorded history and given that much of Africa remains economically underdeveloped and a major food importer, the challenge of supporting such large increases in population will be immense.